Selling an iPhone 8, 64gb Space Gray Version - Model #A1863 that I purchased on 6-1-2018 locally and was told it was a clean, Unlocked phone, only to find out after purchasing that it is Activation Locked and possibly blacklisted / reported Lost-Stolen (different information according to checking multiple IMEI sites). 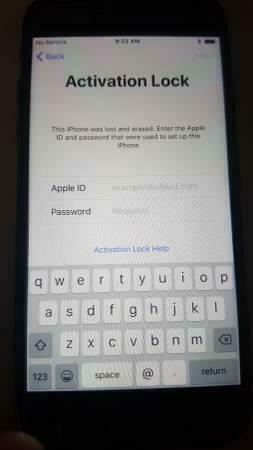 The seller will not tell me the Apple ID and password to get past the Activation lock, so after resetting the phone multiple times, I am able to get as far as the screen showing the one asking for activation and I cannot go any further than that. It looks as if it is a Sprint iPhone 8, Model A1863. The IMEI # is 353002092016996 and the serial # is C7DW1QF7JC6C. Auction comes with the iPhone 8, a Monet case w/ slim sliding storage space (for credit/debit/drivers license), a new USB wall jack and a USB Cable. It came with one of those "tempered glass" screen protectors but it is not sticking completely in the top left corner, but I am leaving it on there to protect the screen. The phone is in immaculate condition, the front glass is perfect and overall the phone is in perfect condition all around except one little spot on the back on the bottom round end corner, maybe 1/32nd of an inch is an imperfection in the glass, I have more pictures I can send if needed. Phone is being sold AS-IS, no refunds-no returns. Please make sure you have read my entire description as that will be proof should you file a claim from being "misrepresented" or "not as described". I will send a followup email after the auction ends and request you reply back stating you have read everything and agree to being sold AS-IS, no refunds-no returns before I will ship it out. I will ship out of the country for whatever the actual shipping cost will be to me to be determined at end of auction, it will NOT be free outside of the US. Very clean and nice apartment for daily rent in the very centre of Tbilisi. Just renovated, with new furniture and central heating. Honda stepwagon 7+1 seats 4X4 is for rent on a daily basis for 30$. the car is insured and there is a possibilty to drive with or without a driver or with a guide. phone: 555 005454 Armen. Native french man providing private lessons - all levels, everybody welcome! Male and Female Teacup Yorkie that are looking for a new home. Male and Female Teacup Yorkie that are looking for a new home. we are up to date on shots and all papers akc registered. small super cute yorkies available. They are both boys. Very sweet with great personalities. They just love people. Non shedding. They will be small. Please have experience with smaller puppies. They are up to date with shots and dewormed. 1 year health guarantee. Apartment for rent. 3rd floor. Newly repaired. with internet, balcony, Built-in wardrobes, fridge. Beds and TV (in case of demand). Worldwide car rental company Naniko in Georgia, offers you different kind of cars and accessories, unlimited mileage and high service in low prices. Nice suni flat. Full ocomodashen. 2 bad rum . Hat voter . Contact me 593540692medea. 4-room apartment,total area 160 sq.m., in good condition,high ceiling and grand balconies with the most beautiful views and sightseengs of the city.Kostava 67,ap.16.for more information mob:599965900. 593346394.